Kent Klewein made the decision to become a fly fishing guide at the young age of 10. All it took was one guided fishing trip that his father took him on for his 10th birthday. Every day following you'd find Kent on one of his local streams or lakes honing his fishing skills until dinner time. 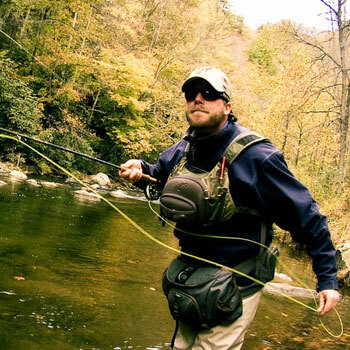 Upon graduation from college with his Bachelor's in Business Administration and completion of Bressler Oufitters fly fishing guide school out of Jackson, WY in 2000, Kent began his guiding career full-time in North Georgia & North Carolina. Kent Klewein is well known in Georgia for being the top guide for putting clients on trophy rainbow and brown trout on Noontootla Creek and its tributaries. Learn how to hook up with these trophies southern style on this show. In 2001, he established Reel Job Fishing, LLC, a fly fishing and conventional guide service targeting trout and bass throughout the southeast. Kent's well known for being the top guide for putting clients on trophy rainbow and brown trout on the Toccoa River and its tributaries located in North Georgia. On his off days you'll find him in his Ranger bass boat chasing big smallmouth and largemouth bass on the fly. Kent's been recognized in publications and media such as The Southeast's Best Fly Fishing, by Author James Buice, American Angler Magazine, Georgia Sportsman Magazine, Trout Unlimited Magazine, ESPN The Fly Fishing Masters, and Aarons Outdoors - Pursuit Channel. He also has been featured in fly fishing catalogs for Scott Fly Rods, Korkers, and Redington. For more information about Kent Klewein, his guide service and blog please visit www.Kent-Klewein.com.